Police ID Maryland Mall Shooter, But Still Search For Motive : The Two-Way Authorities also said they found a backpack near the assailant's body that contained "crude explosives" made of "flash powder and household items." 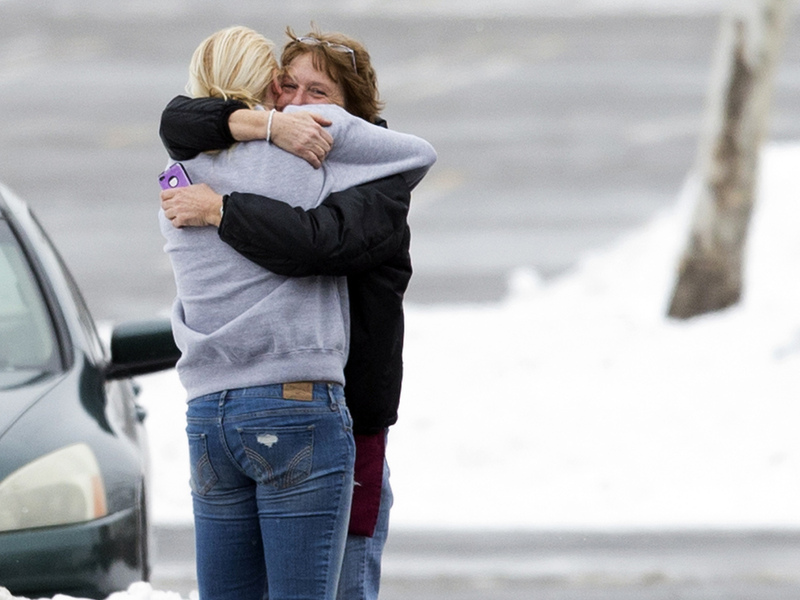 Two people embrace in the parking lot at the scene of a shooting Saturday at the Mall in Columbia in Columbia, Md. Police have identified the gunman who killed two people at a Maryland shopping mall before taking his own life, but officials say they still don't know why he did it or whether the assailant had any relationship with the victims. As we reported, the shooting occurred at about 11 a.m. Saturday at the Mall in Columbia in the Baltimore suburb of Columbia, Md. Howard County Police Chief Bill McMahon said Darion Marcus Aguilar, 19, acted alone when he entered the sprawling shopping complex. Aguilar was carrying a 12-gauge shotgun and a "large amount of ammunition," McMahon said in a news conference on Sunday. The gunman fired six to eight shots, killing a man and a woman who The Washington Post says were employees of a clothing store for skateboarders and snowboarders called Zumiez, located on the mall's second level. Authorities identified the employees as Brianna Benlolo, 21, of College Park, Md., and Tyler Johnson, 25, of Mount Airy, Md. "We have not been able to identify any relationship between him and either of the victims," McMahon told reporters. "But we are working on that." McMahon said police found a backpack near Aguilar's body containing crude explosives made of "flash powder and household items." He said the devices were "not very sophisticated" and were easily rendered safe by police. He said Aguilar's body "was not booby-trapped" and that police had methodically searched the mall, determining there were no other explosives on the premises. "On Sunday, the family of victim Tyler Johnson, issued a statement that said: 'We have lost a kind, positive son who reached out to help others in need, and he made a difference. Our prayers are with him and the other victims and all the people who been touched by this violence.' "